I don’t have much experience with an RV, but I do have a polypropylene gas tank on my Dodge Ram 4x4 and it has a leak in the bottom. Do you have any suggestions on repairing this without removal of tank? I have tried some of the fiberglass repair kits but they did not hold. Frank, the good news is that polypropylene, being a thermoplastic, can be successfully welded. Other thermoplastic tanks common to RVs are made from polyethylene and ABS; all of which can be safely welded. Cement-type repair kits, as you’ve found out, simply will not repair a plastic tank permanently; welding is the only viable method of a permanent repair in my opinion. Another plus, plastic welding can be performed safely on polypropylene gasoline tanks since the practice employs hot air or nitrogen rather than arcing and sparking. Simply draining the tank is all that is necessary. Remember though, the area must be clean and dry to effectively weld. The downside is that it takes specialty equipment in order to weld plastics. Check with your local RV repair facilities. 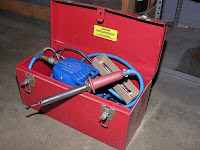 Many shops have plastic welding machines since the same technology is used for polyethylene water tanks and ABS holding tanks as mentioned above. Some RV repair shops will indeed have a welder. Finding them is the difficult task. Let your fingers do the walking first. By the way, if you'd like to learn how to do this yourself, drop me another email. I have a videotape that teaches pro technicians how to weld plastics.